A Valley-built Tornado table is not just another piece of coin-operated equipment. 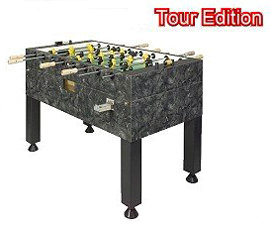 And it's definitely not just another foosball table. Our advice: don't commit to even a single foosball table without taking a close look at Tornado first. You'd quite likely never know what all there is to look for in a table -- and behind it -- otherwise. Then too, without looking closely at a Tornado, you'd find it hard to appreciate -- really even understand -- why it enjoys such a fervent player following. Many attribute it to our being first in the coin-op industry. Others simply dismiss it as player "whim", not all different than a clothing-brand craze. Truth is, it's because of a whole host of subtle features and construction detail... all contributing to an incomparable and very distinct "playability". "Friction Grip" handle - Players come to know the position of the "men" without even looking. Playfield markings - precisely and consistently placed, providing exact visual references for even the most difficult shots. Centerless ground rods - hollowed for lighter weight, smooth action, and fast response. Fielders - counterbalanced and low profile for better visibility. Perfectly symmetrical balls, full-size playfield, 3-man goalie, the crisp "pop" sound of a goal made ..... all "marks" of a Tornado table that players look for. Players want Tornado because the best table lets them play their best!